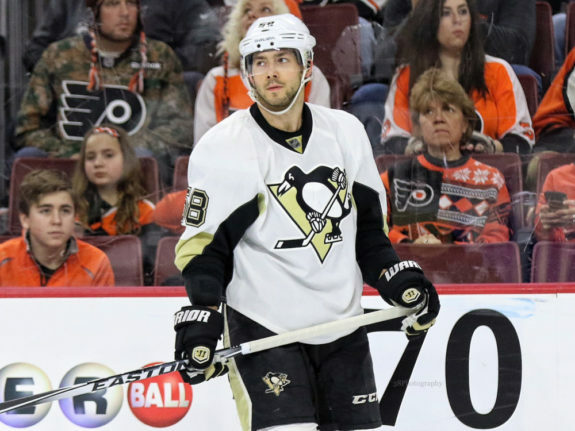 Is Pittsburgh Penguins Defenseman Kris Letang Elite? 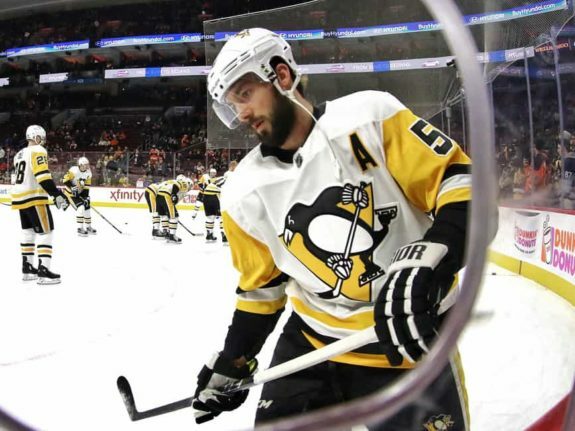 Pittsburgh Penguins’ number one defenseman Kris Letang is one of the more divisive players in the league. Some recognize his offensive abilities as being among the best for a defenseman in addition to his importance to a defense that’s been lackluster at times, and consider him among the game’s elite. They also point to his role on two Stanley Cup-winning teams over the past decade and that he’s been Pittsburgh’s number one defenseman for eight seasons. Then there are those who point to Letang’s play in the defensive zone, his decision-making with the puck, and his struggles to stay healthy and suggest that he’s nothing more than a very good defenseman on some great teams, surrounded by truly elite talent in Sidney Crosby and Evgeni Malkin. What Does His Contract Say About Him? For starters, let’s look at Letang’s contract and see if he is paid like an elite defenseman. The 2018-19 season will be the fifth year of an eight-year, $58 million contract the Penguins signed him to in June 2013. The deal, which didn’t go into effect until the 2014-15 season, has a $7.25 million cap hit, a full No Move Clause, and a Modified No Trade Clause that includes an 18-team approval list. Currently 31 years old, Letang was 27 when the contract started, which, at the time, carried the fourth-highest cap hit among defensemen after P.K. Subban, Shea Weber, and Ryan Suter. It was also 16th-highest overall and third-highest on the Penguins behind Malkin and Crosby. Now, after five years, his cap hit is the league’s ninth-highest for a blueliner, tied for 36th overall, and is fourth-highest on the team. Compared to others at his position, Letang’s contract conveys that he is an elite defenseman. His cap hit remains lower than those of Subban, Hedman, and Brent Burns, three players often deemed elite. But it is also a higher cap hit than Drew Doughty and Erik Karlsson’s hits, at least until their new contracts start in 2018-19. Those are quite a bit higher than his $71,785 cost-per-point and rank of 378th in 2013-14, the last year of his previous contract which carried a $3.5 million cap hit. By comparison, in 2017-18, among Subban, Doughty, Karlsson, Burns, and Hedman, winners of five of the last six Norris Trophies, only Subban had a higher cost-per-point than Letang did. So by cost-per-point, Letang’s contract doesn’t provide the same value that other top defensemen do with their contracts. Of course, if Letang provides the Penguins with high levels of production on a yearly basis, his high cost-per-point isn’t a big deal. In his regular season career, he has 682 games played, 96 goals, 437 points, and 35 power play goals. He is a plus-48 while averaging 23:38 of ice time and has provided 74.1 point shares. He has also appeared in 128 playoff games with 21 goals, 79 points, nine power play goals, and is a plus-10 in 23:45 of average ice time. Although he debuted during the 2006-07 season and played in seven games that season, he didn’t become a full-time player until the 2007-08 season. Since that season, Letang ranks first among Pittsburgh defensemen in nearly every category with 191 more games played, 65 more goals, 301 more points, 14 more power play goals, and 48.0 more point shares than anyone else. 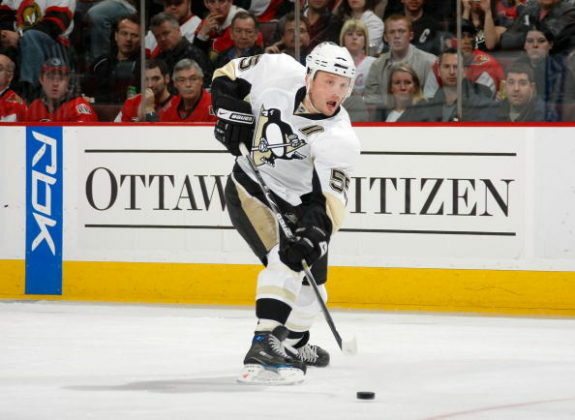 The only area he isn’t first in is points-per-game, where Sergei Gonchar’s .81 are higher than Letang’s .64. Gonchar is also in second place behind Letang in all categories but games played and point shares. Among current Penguins blueliners, Letang has an even larger lead with 373 more games, 70 more goals, 342 more points, 29 more power play goals, and 52.6 more point shares than anyone else. He has led their blueline in average ice time in all but one season since 2010-11 and often by several minutes per game. It’s much of the same in the postseason with Letang holding a 41-game, 15-goal, 39-point, and five-power play goal lead over other Penguins defensemen since the 2007-08 season. Letang has stood out among Pittsburgh defensemen throughout his career but his greatness is kept in check when he’s compared with the rest of the league. Since the 2007-08 season, he’s top-10 among defensemen in just two categories: his 435 points are ninth-most and .64 points-per-game (P/G) are tied for 10th. He’s in the top-20 in three other categories – goals, power play goals, and point shares, but outside the top-40 in games played. In the postseason, it’s a different story as he’s in the top-five in games, goals, points, and power play goals. Some of this is a testament to playing on great Penguins teams but it also points to how impactful he’s been in the playoffs. It’s easy to see why he ranks so high as he’s played in double-digit games in seven postseasons and has accumulated at least 10 points in four. Both tie for first among blueliners since 2007-08. Although his cumulative stats suggest he should be considered one of the game’s top blueliners, his per-season stats suggest otherwise. Among defensemen, he’s been in the top-10 in points four times – 2010-11 (T-7th), 2012-13 (T-1st), 2014-15 (7th), and 2015-16 (3rd). Furthermore, 2017-18 was his first season in the top-10 for average ice time with 25:20 per game, which ranked eighth. To answer that question, I think it’s important to define what “elite” means. Is it being the best at a player’s position for one season or perhaps multiple seasons? Is it defined by the accumulation of stats over a long period of time? Or is it by being among the top players at a position for a certain period of time? I define a player as elite if he has been among the top-five at his position for at least three consecutive seasons. So, now that I’ve defined what elite means to me, there are aspects of his game that need considered before confidently answering if Letang is elite. I think for a player to be considered among the best at his position, he has to remain relatively healthy. Of course injuries occur and players get banged up in a sport as rough as hockey, but a player has to play to be elite. 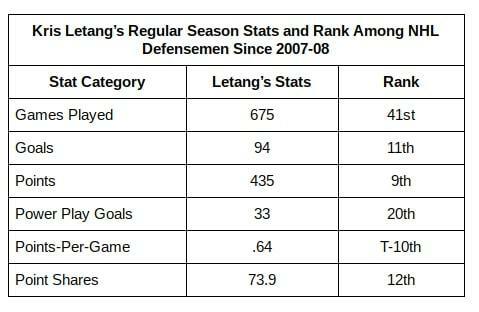 And if you’ve watched hockey the past decade, you know that Letang has not been a healthy player. In his 11 seasons as a full-time player, he has just one full season in his career, in 2010-11. He’s missed at least 10 games in six of the past seven seasons, including at least 31 in 2011-12, 2013-14, and 2016-17. His injuries also haven’t been typical. 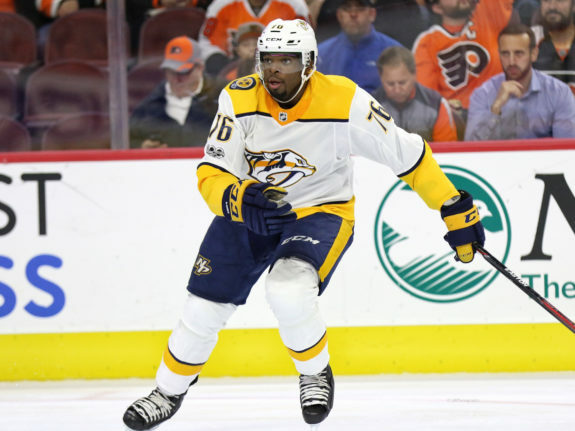 In his career, he’s had three concussions, an elbow infection following surgery, a shoulder injury, and a stroke that cost him over half the 2013-14 season. He also suffered from a herniated disc and severe neck injury which led to surgery that kept him out of the 2017 Playoffs. Some of these, like the stroke and elbow infection, aren’t likely to be repeated, but multiple concussions can lead to lingering effects and, at 31 years old, Letang is now past his prime when health is less of a sure thing. So, does he stay healthy as is expected from elite players? No. Is His Production Elite for the Position? I’ve already compared Letang’s output to fellow defensemen and reached the conclusion that for his career he’s had strong numbers that get weaker on a per-season basis, the result of his injury history. But this question is slightly different than what’s been previously discussed. His four 50-point seasons since 2007-08 are third-most among blueliners and his four seasons with at least a .75 P/G average while playing in at least 41 games are second only to Karlsson. That’s the good. Now for the bad. His five seasons with 70 or more games played are tied for 56th at his position while his two seasons with at least five power play goals are tied for 33rd. Even by time on ice, although much higher than other Pittsburgh defensemen in his career, he doesn’t rank well compared to the league. Since 2007-08, his 285 regular season games with at least 25 minutes of ice time are 11th-most among defensemen while his 52 playoff games with that many minutes tie for sixth. A player, especially a top defenseman, has to be on the ice to be able to provide offense. So, does he produce at an elite level? No. Does He Control the Puck Well? Although offensive production is key for an elite defenseman, equally as important is his ability to control the puck, both keeping it away from opponents and recovering it. Both are questionable areas for Letang. Although the plus/minus stat is an outdated one, his plus-51 rating since the 2007-08 season is tied for 38th among blueliners. He’s also never had a positive turnover margin in a season and was a minus-36 in turnovers in all situations in 2017-18, a career low and the worst margin among Pittsburgh defensemen. However, this is common for number one defensemen who often have the puck on their stick. Last season, Letang’s minus-36 was better than Doughty, Burns, and Subban, and just worse than Suter. So, does he control the puck well? Yes, he’s in line with other top defensemen. At five-on-five, Letang’s goals-per-60 decreased the past two seasons and his assists and points-per-60 in 2017-18 were the third-lowest of his career. Meanwhile, his shots-per-60 at five-on-five have increased the past two seasons to a career-high 7.07 shots-per-60 (S/60) last season. On the power play, his points-per-60 decreased for the second straight season and his shots-per-60 have decreased four straight seasons to a career-low 8.08 S/60 in 2017-18. Both occurred while averaging 3:06 per game on the man advantage, his second straight season of regression and the third-lowest average of his career. In all situations, Letang has regressed in goals and points-per-60 two straight seasons and the number of scoring chances he generated per-60 last season were the second-lowest of his career. His .65 P/G were his lowest since 2013-14 and his .11 goals-per-game were his lowest since 2010-11. These trends are not on Letang’s side, considering his decline started at the tail end of his peak and are likely to continue now that he’s into his 30’s. A great way to compare players of the same position is Hockey-Reference’s similarity scores tool which looks at players’ adjusted point shares. Adjusted point shares measures how many points in the standings a player contributed to his team in a given season and is then adjusted for era. Once a player’s adjusted point shares is calculated, he’s compared to other players and a similarity score is generated with 100 being a perfect match. Through Letang’s first 12 seasons, he best matches up with Serge Savard, Sylvio Mantha, and Darryl Sydor. Considering Savard and Mantha are in the Hockey Hall of Fame, this is an encouraging defense of calling Letang elite. However, just because both are in the Hall of Fame doesn’t mean they were elite. Savard never won a Norris Trophy, but had four top-five finishes and was a one-time All-Star. During his career, he was only top-five among defensemen in games and defensive point shares. This is not surprising considering he played in an era with Bobby Orr, Denis Potvin, and Larry Robinson. Mantha played in the early stages of the NHL, which makes it hard to compare eras, but he was top-five in games, point shares, and defensive point shares among defensemen for his career. He also played at the same time as Eddie Shore and King Clancy. Lastly, while Sydor isn’t a member of the Hockey Hall of Fame, he was good. As a full-time player, he was top-five in games played among blueliners for his career. He also never finished top-five in Norris voting, partially the result of playing at the same time as Nicklas Lidstrom, Scott Niedermayer, Chris Pronger, and Chris Chelios. 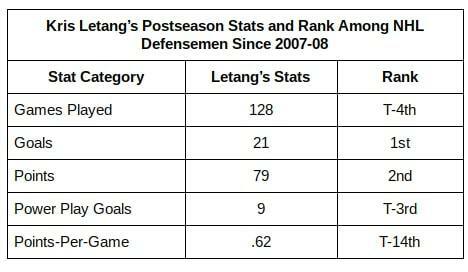 Letang’s similarity scores point to a potential Hall of Fame career but that still doesn’t mean he’s elite. None of the three players he is most similar to were elite for their eras as other defensemen were better. That may be what Letang encounters as he plays in an era with Karlsson, Doughty, and Duncan Keith, all future Hall of Famers and Norris Trophy winners. The short answer is no. He is a very good player who’s had some highs that rival those of Hall of Famers, but his lows are quite low and he doesn’t check enough boxes to be considered elite. He hasn’t won a Norris Trophy and was a finalist just once and has two top-five finishes. He’s been named an All-Star twice, both to the second team, and hasn’t consistently been among the five best at his position. He is a great offensive defenseman but struggles in his own zone, turns the puck over at inopportune times, and lacks the consistency required to be elite. He has also missed far too many games in his career and can’t carry his team the same way that truly elite defensemen like Karlsson, Burns, and Doughty do.